Cabo San Lucas has been and continues to be one of the world's greatest sport fishing destinations, and with good reason. Known as the "Marlin Capital of the World", the waters off Los Cabos, Mexico benefit from the merging of two major bodies of water – the Pacific Ocean and the Sea of Cortez. Nutrient rich waters driven by offshore currents lure a variety of game fish to the area providing year-round action on species like marlin, sailfish, swordfish, dorado, tuna and wahoo. Throw in outstanding surf and fly-fishing and you have the makings of a true sport fishing enthusiast's dream destination. 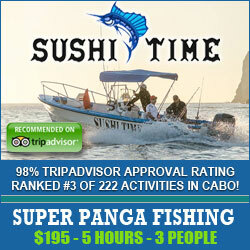 In this section of Cabo's Best, you'll find all types of information that will help make your Los Cabos fishing trip a success. Take the time to check out the best in Cabo sport fishing charters, read the latest fishing reports, get fishing tips… even learn what you'll need to do to take your fish home from Mexico. Use the navigation panel to the left to browse through this section of our site or to return to the main Los Cabos activities page. 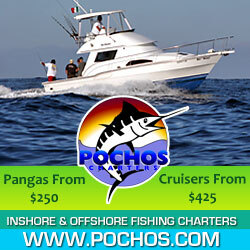 If you're looking for quick answers to the most common questions about fishing in Los Cabos, visit our FAQ's page. Cabo San Lucas lays claim to nearly 70 world record fish including catches in the all-tackle, line-class and fly-fishing categories. Not many places offer up the chance at setting a new world record, but Los Cabos can… and does. Three recent records stand out for their sheer size. First, we tip our hat to Jim Dillon who owns and operates Salvador's Sport Fishing with his partner, Captain Salvador Ocampo. On July 31st, 2001 and Jim was on his last day in town with a flight back to San Diego that afternoon. Not wanting to waste the chance to go out for a short fishing trip, he and Salvador left the marina around 7am. At 7:45am one of the rods bent and the reel started screaming. At first they thought it was a striped marlin, maybe a big sailfish. After the fish jumped close enough to identify, they saw iit was a dorado... a BIG dorado! !Back at the docks a weigh in with a certified scale came to 85lbs. An 80lb line record that still holds the title to this day! 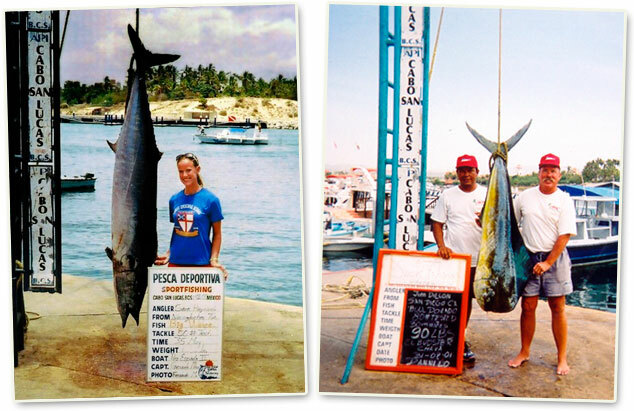 LEFT: Sara Hayward with her 184lb Wahoo caught in Cabo San Lucas. RIGHT: Jim Dillon (left) and Salvador Ocampo (right) with the 80lb line class world record Dorado. ALL TACKLE WORLD RECORD CABO WAHOO TIPS THE SCALES AT 184LBS!! Back in 2007, then 15 year old Sara Hayward fishing aboard a local boat, the Pez Espada II,hooked into a monster 184lb hoo' crushed a Mean Joe Green trolling lure. Sara's catch beat the standing world record by over 25 pounds.... a 158.5lber caught off San Salvador island, Bahamas. 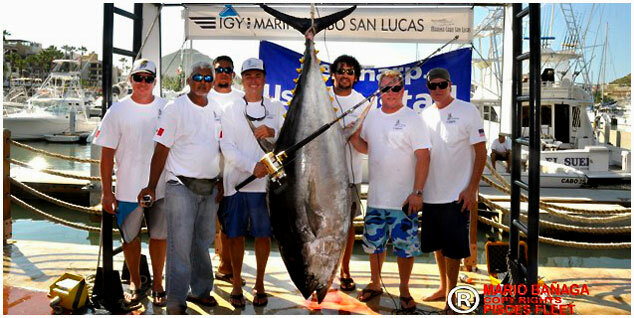 Guy Yocum of Dana Point (picture with rod/reel) poses with the new world record Yellowfin Tuna along with the crew of El Suertado at the weigh station in Cabo in October of 2012. 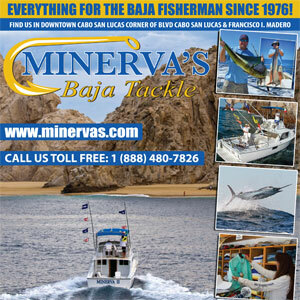 Photo courtesy of Mario Banaga, Pisces Sportfishing. If you've never experienced competitive offshore fishing, you're in for a treat. The video above is a compilation of footage shot aboard Angel and the Badman II. Capt. Alex Edwards and his crew won the 2007 Bisbee's Black and Blue tournament plus they've placed in many other Los Cabos based tourneys. These guys are pros and make it look easy. Turn up the sound, click play, and see what all the excitement is about when it comes to world-class sportfishing in Los Cabos. This is must-watch video for those who love to fish for marlin and have always wanted to see what happens beneath the surface of the water. Dr. Terry Maas – working with Captain Mike McGettigan and Sherry Shaffer of the Ambar III – hit the Golden Gate Bank just north of Cabo San Lucas capturing some of the most dramatic footage of feeding striped marlin we've ever seen. Throw in some finback whales, seals, tuna and dorado and you have the ultimate video clip for saltwater fishing enthusiasts.